We’re guessing that you already know what Field Day is and what insane fun it has in store for you. But to be safe, we’re not talking about a day out in the open fields in the middle of nowhere. We’re talking about the Field Day that happens right in the middle of Sydney — and the biggest one, if we might add. After all, how can you miss the grandest celebration ever? And this coming New Year’s, you’re in for a treat. These artists are going to blow your mind and get the start of your year up, dancing and revved up for more excitement. Born in British Columbia, B. Traits started making a name for herself at the age of 18. Her incredible music style bordering around EDM, breakbeat, house, rave and techno has put many in a state of reverie and daydream with a hint of blast from the past. Let her take you into a whirlwind on Field Day just to start your new year with some feel-good vibes. Bearing their self-described music style — Super House, Andhim is the magical duo in the world of EDM that will fill your bones with soul and passion with every drop of the beat. Containing a fine and organic approach, these boys define dance music as an experience like no other. Their own interpretation of electornic dance music will bring any listener into a fit of uncontainable energy and euphoria. Experience the ecstacy we are talking about on Field Day as the duo invades the stage with their incredible talent and skill to make the beat drop and your body entrance. The world of music is turning upside down and George Maple is always at the forefront in putting out new genres you will surely love. Growing up in the Northern Beaches of Sydney, George Maple is never shy talking about Home and Away as well as using the show as an advantage to give people a picture about her hometown. In terms of music, she loves the idea of creating a story around her album — just like the album The Miseducation of Lauryn Hill in 1998. Obviously, hers is going to be a different mix with the combination of soul, glitch beats and trip-hop. With multiple professions under her belt, Anna Lunoe is a force to be reckoned with. She has performed in a few music festivals including Coachella and has been a host of Apple Music’s Beats1 Radio 2015. Born in Sydney, Lunoe has always had a passion for song writing with the help of her acoustic guitar. Several her songs have gathered recognition all around the globe — even being picked out by Skrillex himself. If that’s not enough, she has spun for Chanel and Prada for their fashion runways and became the first woman to curate for the Ministry of Sound in Australia. So, if you’re hunting a style of music that can bring bold and fearless to the table, Anna Lunoe is a top contender you would want to get to know now. Imagine the combination of glitchy textures, delicate beats, amazing vocals and profound sounds. If that’s the kind of music you’re looking for, then you might as well head and check out the works of Kučka. As an Australian producer, Kučka has made her mark in the music industry — releasing her self-titled debut EP in 2012 which has won praise for its experimental sound techniques involving electro-pop. From there, her music career flourished working with big names like A$AP Rocky. If we’re going to talk about trap and bass music, no fan will ever miss the name Baauer. Starting his career at the age of 13, Baauer has produced mixes for notable names like Nero, The Prodigy, Flosstradamus and No Doubt. In 2013, Baauer won the Dance Song of the Year and EDM Song of the Year category at the 2013 Billboard Music Awards for his song “Harlem Shake”. That same year, Baauer was named one of Fuse TV’s 30 must-see artists at SXSW. Next year, he will start up your year on New Year’s at Field Day. If you’re one for the Grammy’s, then you surely know the name DJ Snake. A Grammy-nominated artist and producer, DJ Snake has made a name for himself in the genre of trap, house, EDM and pop. From working with MØ to Lady Gaga, DJ Snake is no stranger to the spotlight. In fact, he featured Justin Bieber in one of his works — Let Me Love You, which has been nominated Dance Artist of the Year and Dance Song of the Year. If that’s not a call for a New Year’s celebration at Field Day, then we don’t know what is. With the song Lovesick behind his list of incredible credentials which reached the top of Spotify’s Viral Charts in the UK and the United States, Mura Masa does not disappoint the origin of his moniker. Being a multi-instrumentalist, Mura Masa always had an affinity for music which eventually led to his discovery of trap music. Today, he is an electronic music producer and songwriter with his new album released during the first half of this year. Next year, it’s your turn to know what he’s up to. 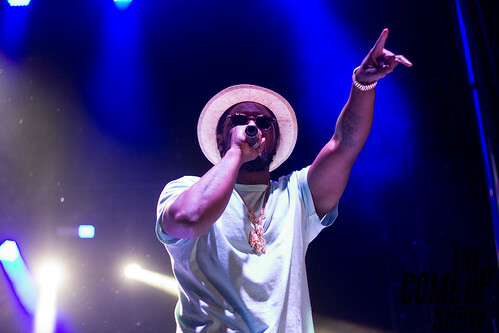 Topping charts after charts of the US Billboard 100 and 200, there’s no reason why you won’t look forward to another performance brought to you by Schoolboy Q. A member of Black Hippy alongside fellow California-based rappers like Ab-Soul, Jay Rock and Kendrick Lamar, Schoolboy Q has made a name for himself in the world of hip hop. His new album is said to be a peak into the other side of him. And while we may not be certain whether or not you will see this side of him on Field Day, you can definitely look forward to an unforgettable celebration with Schoolboy Q on the stage. If you have no idea who Flume is, then you are completely missing out. If you do, then you’re probably singing the song right now. Whichever it is, it’s hard not to love Flume no matter what your genre of preference may be. He has worked with noteworthy names like Lorde, Sam Smith and Disclosure. To top that off, his self-titled debut studio album received positive reviews including a double-platinum recognition in Australia. And on New Year’s, who knows what you can expect? One thing is certain, you will be in the front seat to a whole new music adventure with Flume. Now you might plan to head on over to Field Day straight away, but where’s the fun in that? After all, the celebration always starts before you get out of the door. That’s why they call it a pre-party, right? So instead of getting a designated driver, why not opt for a scheduled Uber or a taxi, because we all know that getting drunk is everyone’s right (or something to that calibre). Of course, if you’re a big group and a normal car won’t do, we suggest continuing the party on your way to the venue with our Party Shuttle Bus for hire. We’ve got up to 50 seats ready to make your ride a wild one. Party to-and-from home with us and don’t miss out on our LED and laser lights. Did we mention that we have a pole? And to guarantee you and your loved ones’ safety during this new year, we’ve got GPS tracking enabled to keep you on the loop. In fact, we can even pick you up at 3 am or 4am, pick whichever time you want, and bring you back home safely! Call us at 0450 060 055 or enquire online here! Now, which artist are you looking forward to see most on Field Day?